Home Blog Are You Losing Energy Due to Poor Insulation? Winter months can be harsh on any homeowner. It's not just about the weather and biting cold but also the utility bills. If your region is prone to cold weather, it's common to see energy costs spiral upwards in keeping with increased heating needs. Proper insulation is the key but in many cases, the garage door is often forgotten when it comes to keeping your house warm. Many of us with attached garages forget this is a common place for energy to escape. Take a good look at the weather stripping and the seal at the bottom of your garage door. There should be no cracks or signs of wearing out. If you place your hand, there shouldn't be any draft. If you do detect a draft or visible signs of wear and tear, replace the weather stripping and seal if needed. What Is Your Insulation Situation? Weather stripping and bottom seals will not solve your insulation issues alone. 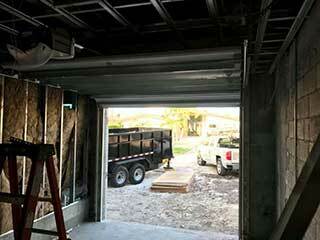 Ensuring a fully insulated garage door is always the best option. Although it's possible for the existing garage door to be insulated, we usually recommend that you invest in a new one if your door is already worn and a number of years old. Adding new insulation can affect the counterbalancing of the springs meaning excess weight that's added will need to be counterbalanced - the springs may well need to be adjusted or replaced. If there is a door inside the garage that leads to the house, we also recommend keeping that door insulated too. Over time, you should definitely see a drop in your utility bills, while your home remains cozy and comfortable.